In this podcast, Bob describes the Buddhist view of suicide as a big mistake because of its dependence on the nonsensical belief that one is only the material of their body and that nothing can exist. Recorded in Bhutan, October 2005. 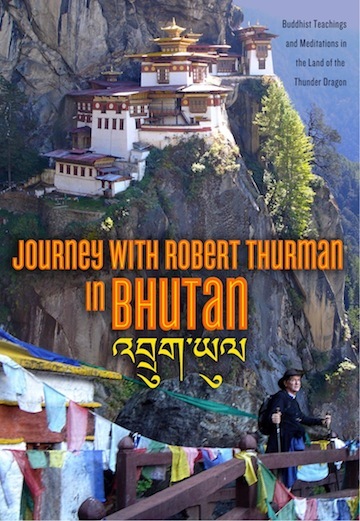 The new film, Journey with Robert Thurman in Bhutan: Buddhist Teachings and Meditations in the Land of the Thunder Dragon is now available. In this podcast, Bob explains why Western, materialist economics is ultimately doomed and how Bhutan's Gross National Happiness should evolve into Gross Planetary Happiness. In this podcast, Bob explains why he's a self-proclaimed 'Buddhaholic' with his version of Pascal's Wager, or how a plan for the continuity of consciousness after physical death is a no-lose situation.